The Euro closed relatively unchanged just above 1.13 as soft US data interrupted the dollar's rally. The ADP Employment Change showed that the private sector added 183K new jobs in February, less than the 189K expected, while the December Trade Balance deficit increased to $59.8B. Today, the main focus will be on the EU, as it will release the Q4 GDP, expected unchanged from the previous estimate of 0.2%, later on the ECB will have a press conference to update on their monetary policy outlook. Investors are anticipating that policymakers will keep rates on hold, with possible downward revisions to growth and inflation forecast. 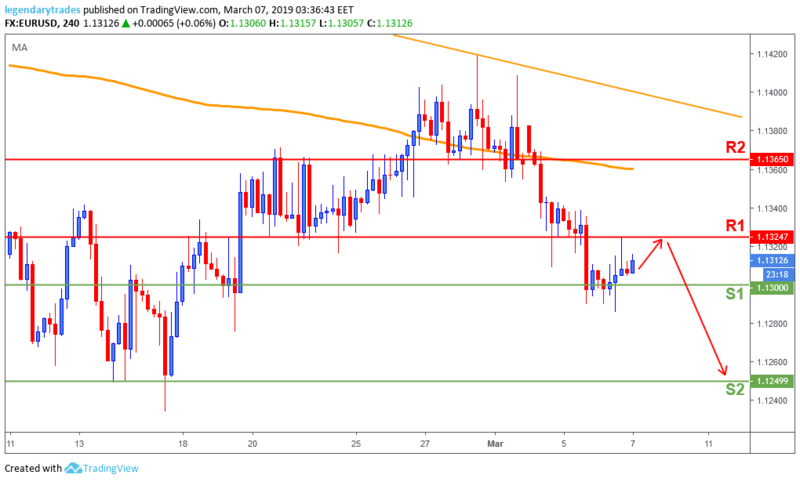 The Euro attempted to break below 1.13 (S1) multiple times in yesterday’s session, but the bulls were able to hold that level. Price increased towards 1.1325 (R1) before hitting resistance and tumbling back down. Price is stuck between 1.1325 (R1) and 1.13 (S1) for now, we need a break to either side to confirm the next possible trajectory. But Technical indicators lack directional strength within negative levels, reflecting the absence of buying interest.